I was given the long awaited change to take part in a yarn bomb earlier this year. One of my good friends posted a "hookers wanted" shout out for crocuses. Once I'd checked out The Willow Wanderer I knew I had to take part. The stars aligned with a day in bed with a stinking cold, and a fittingly purple yarn stash. 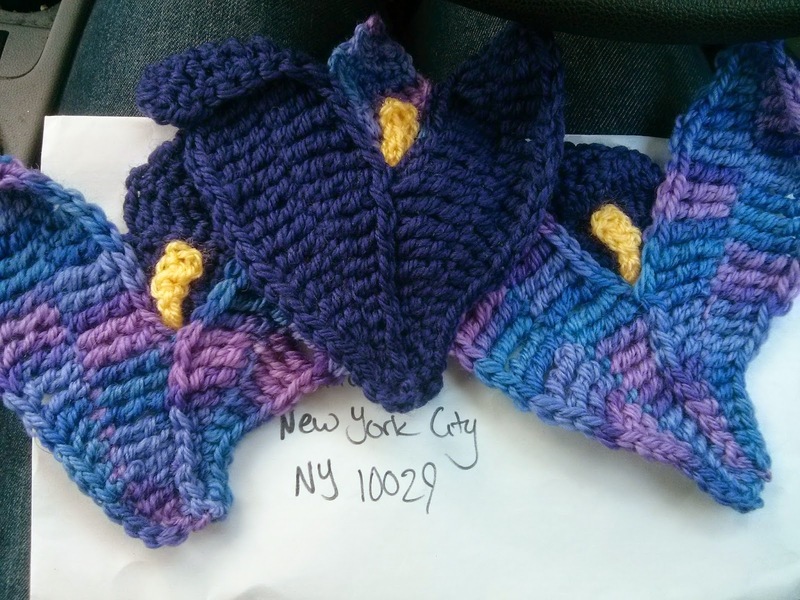 Happy joy of hooking, the crocuses were quick and easy, and I was able to get them in the post to NYC in time to take part. Yes that's right, a few of those teensy crocuses are mine *proud*. and God shall raise those bright blue eyes,those sunny waves of hair. but for an endless age of bliss, shall rise our heart’s dear flower. If you get the chance, take a good look at Naomi's blog. She makes beautiful yarn bombs that really serve to brighten up the environment. I love that they are not about whimsy, as yarn bombs often are. My favourite has to be the orange day lily. Absolutely gorgeous! Who wouldn't want this on their fence?